Today's headphone market offers everything from near-disposable cheapest to pro-grade recording monitors. With such a wide range of headphones available it's often hard to determine which are the best in-ear headphones, both literally and figuratively. 2. What Do Earbuds Do? 3. How Do Earbuds Work? 4. Where Can You Buy Earbuds? This article will focus specifically on premium in-ear headphones, also known as earbuds, intended for high-quality listening. We'll break down some characteristics to look for in a set of premium earbuds and rank 10 of the top products available for the recreational listener seeking a top quality experience. Earbuds are a style of headphones that fit within the ear and connect to an external source that provides audio content (i.e., smartphone, mp3 player, Betamax). The ergonomic fit of earbuds set them apart from other types of headphones, which typically sit on top of the ear hole or surround the entire ear. Like all headphones, earbuds transmit audible sound from an audio source into the ear. Earbuds are typically smaller, lighter and have a lower profile than other types of headphones. This makes them an ideal choice for use during physical activities like running. In simple terms, earbuds convert a digitized audio signal into audible sound. This happens by converting electrical audio signals into audible sound in a section of the earbud called the driver. The driver is like that moves air frequencies into the ear with a small diaphragm. These frequencies then cause the sound receptors within the ear to vibrate, generating the perception of sound in the brain. There two main forms of earbuds on the market—wired and wireless. Wired earbuds carry that electrical audio signal to the driver through wires that make a physical connection to the audio source. Wireless earbuds transmit the audio signal—you guessed it—wirelessly from the audio source to drivers most often using Bluetooth. Premium quality earbuds are available for purchase from a wide range of online and brick-and-mortar retailers. A complete range can be found on major online retailers like Amazon.com, Jet.com, and eBay as well as through music retailers like Reverb.com and SamAsh.com. These days big box retailers like Walmart and Target also frequently carry high-quality earbuds. 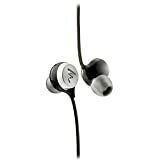 Dedicated music shops like Guitar Center usually stock a range of higher-end earbuds made specifically for performing musicians. While there are some much higher and lower-end earbuds on the market, this article will focus on products ranging from $50 to $200. 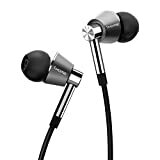 For this list, we considered a wide range of variables including the prices, features, manufacturer warranty, availability and overall pros and cons of each set of earbuds. Each of the reviews compared the products relative quality and price with the other products in this category. The products in this review start around $50 and go up to around $200. 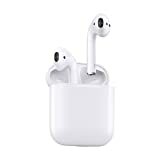 There are many feature differences that can swing the price of earbuds like, for example, wireless Bluetooth connectivity. A product's fit and finish is also a factor, with higher-end products using materials metals and lower-end products using plastic. Another contributing factor is audio quality. 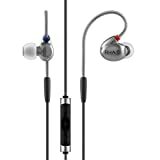 More expensive earbuds will often feature multiple drivers, giving a wider range of audio fidelity while less expensive earbuds usually feature just one driver. The Bose SoundTrue Ultra are wired earbuds that feature a simple design specifically for those who prefer a shallow feel in the ear. The SoundTrue Ultra's eartip is slightly shorter than some of its competition, making it ideal for extended use. They feature crisp, balanced sound and an integrated microphone for making and receiving calls. Other key features are integrated volume control and two color options—black and mint green. The Bose SoundTrue Ultra sells for between $70 and $100 at various retailers. Bose backs their headphones with a two-year limited warranty. The speakers within these headphones are backed by a separated five-year warranty. The Focal Sphere is a noise-canceling earbud that features a comfortable housing and a variety of useful accessories. The Sphere comes in a stylish carry case that with a selection of different ear tips and a two-prong, right angle adaptor ideal for use on airplanes. The sonic range of the Focal Sphere is pleasingly balanced with crisp highs and full, powerful lows. They also feature a microphone and volume control that doubles as an answer/hang-up button for calls and a start/pause button for audio. The Focal Sphere retails for a street price between $60 and $90. Focal covers Sphere earbuds in the United States by a one-year, non-transferrable warranty. This warranty may differ for customers in other countries. The 1More Triple Driver earbud features an attractive fit and finishes well as a robust cable reinforced by Kevlar. The set comes with a wide selection of silicone eartips and high quality carrying case. The volume control features plug-and-play compatibility with both Android and iOS devices, making it easy to get the most from your device. The Focal Sphere retails for a street price between $70 and $100. The Bowers and Wilkins C5 S2 is the newest edition of their lauded C5 series earbuds. They feature audiophile quality marked with high-end clarity and increased definition in bass frequencies. The S2 also features design tweaks including an all-black cable to replace the previous clear unit. S2 earbuds also have an ultra-sturdy loop design to keep the buds securely in place during heavy activity. The unit additionally features volume control and microphone compatible with Apple devices. 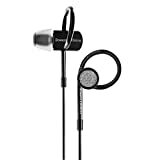 The Bowers and Wilkins C5 S2 sells for around $80 - $110 online. Bowers & Wilkins offers a two-year, non-transferable warranty on all of their headphones. This only applies to products purchased through authorized dealers and customers are responsible for any associated costs like shipping to and from the manufacturer for repair or replacement. The RHA T10i boasts an eye-catching chassis built from injection-molded stainless steel. These uber-solid earbuds also come with a wide range of customizing accessories including multiple silicone ear tips, carry case and most notably, three different audio filters. The T10i's inline microphone and volume control are compatible with iOS devices making it easy to take calls on the fly. The RHA T10i runs between $120 and $150 at online retailers. RHA backs the T10i and a selection of their other products with an impressive three-year warranty. The warranty covers manufacturing defects resulting under normal use conditions. Apple’s AirPod earbuds offer a fully wireless option for those looking cut the cord from both ears. These earbuds connect wirelessly via Bluetooth to an audio source and provide good quality audio and calling in an ultra-light package. Unlike many Bluetooth earbuds on the market, these do not connect to one another with a wire, providing a truly free range of motion. AirPods feature Apple’s signature minimal design with a distinct similarity to their classic wired earbuds.​. Apple AirPods are widely available online for around $140 but range up to around $170. Apple covers AirPods with a one-year warranty covering defects in manufacturing quality and workmanship. The Bose SoundSport Wireless headphones feature a sweat-resistant housing ideal runners and cyclists. 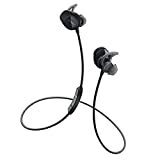 Like the Bose SoundTrue Ultra, the SoundSport offers a shallower ear tip and soft, silicone stabilizing piece creating a comfortable and secure fit for those long runs and rides. This updated SoundSport model features wireless Bluetooth connectivity, allowing active greater mobility without sacrificing audio quality. The Bose SoundSport Wireless earbud set is available for around $140 - $170. Like the Bose SoundTrue Ultra, the SoundSport Wireless includes a two-year warranty. BeatsX are Bluetooth enabled wireless earbuds with a neckband style attachment and inline microphone/volume controls. This Beats by Dre offering competes with the Bose SoundSport in the water/sweat resistant market, making it another viable choice for workouts. They feature automatic pairing with Apple devices and a comfortable, secure fit that will stay put during a sweaty jog. BeatsX earbuds sell for between $110 and $450 through various retailers. Apple owns Beats, and their headphones include Apple’s one-year warranty. The Jabra Elite Active 65t retails online for between $180 and $210. 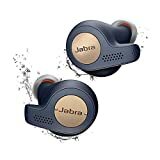 The Jabra Elite Active 65t has a limited two-year warranted that includes protection from dust and sweat thanks to the product's IP-65 water resistance rating. 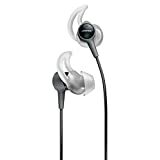 The JBL Endurance Sprint is a neckband style wireless earbud set that is a low-cost and fully waterproof. These sport-inspired earbuds have a soft, comfortable fit good for longer use periods. They also include touch controls for receiving calls and adjusting the volume level. An over-ear hook construction makes it nearly impossible for them to fall out during use. 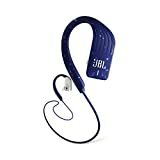 The JBL Endurance Sprint is available now for around $40 - $70. JBL covers their Endurance Sprint wireless earbuds with a one-year limited warranty. If there’s one thing we’ve learned in our research about earbuds in 2018, it’s that there is truly something out there for everyone. Need low-cost, wireless earbuds to use warming up for your next swim meet? You got it. Prefer something made from bombproof stainless steel? It’s out there for you. For our top overall choice, we’ve selected the Bowers & Wilkins C5 S2. These earbuds provide audiophile-quality sound in a tough, comfortable package. Best yet, they come at an affordable price that’s right in the middle of the pack. The C5 S2 has an aesthetic that is both stylish and functional with plenty of comfort for long stretches of focused listening.